I love chili. 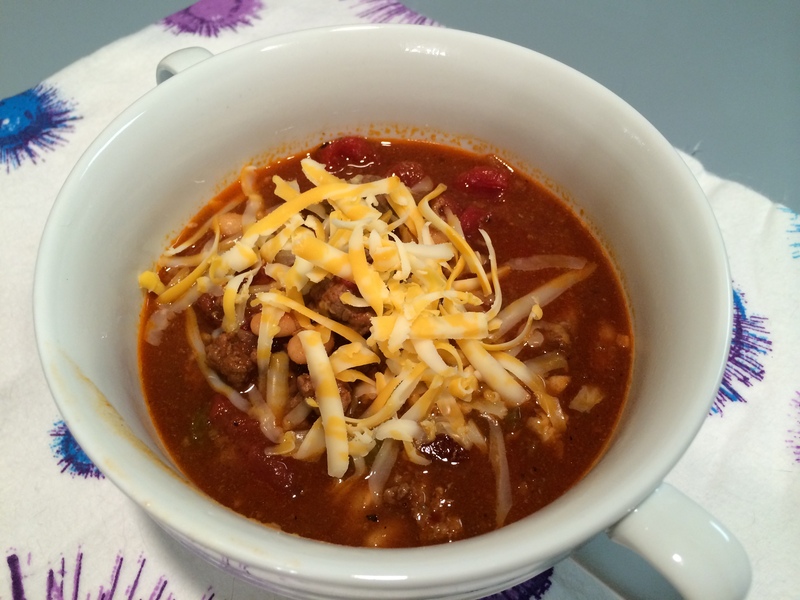 I love crockpot chili even better! I’ve mentioned it before but long ago I found the perfect chili recipe and somehow lost it and could never find it again. 🙁 I’ve tried every recipe I’ve come across that sounded even remotely close to that recipe but still haven’t found the perfect replacement. This is the recipe that I based my recipe on. I made some changes because I am still trying to recreate that old recipe. Add the ground beef, onion and garlic and cook for about 7-10 minutes or until the beef is completely browned, crumbling the beef with a spoon as it cooks. Taste, and season with additional salt and pepper or seasonings if need be. **If you don't like kidney beans, you can also substitute in black beans, pinto beans, or great northern beans. A little while ago Michael and I went to a friend’s house for lunch and games and they made a really tasty chili. She used chunks of beef instead of ground beef and I loved the idea. 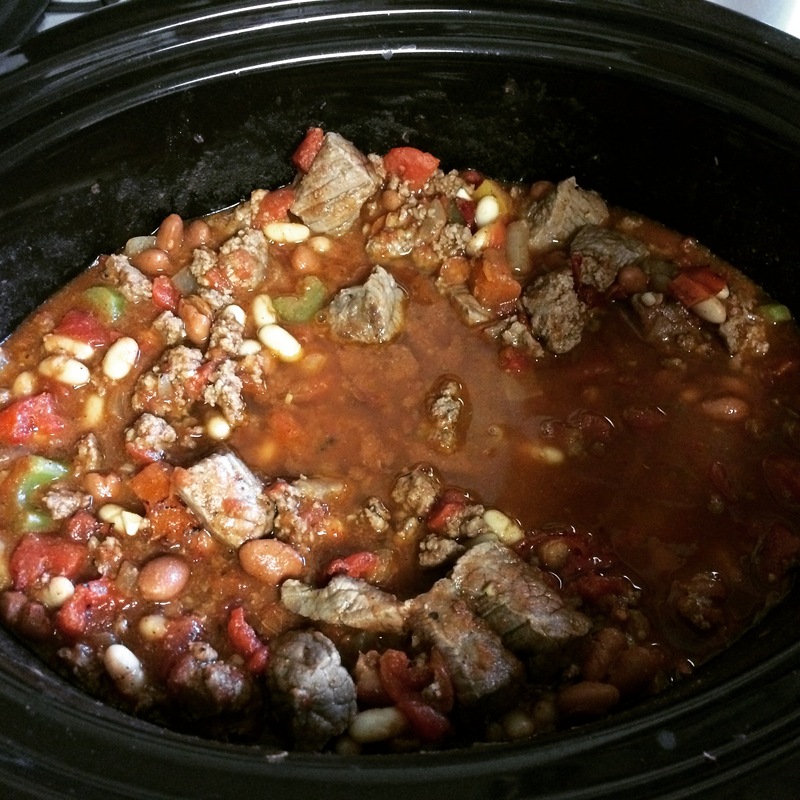 So when I decided to make chili for the Superbowl I did a combination of ground beef and chunks of beef. I seared the chunks of beef in a skillet (it was less than a pound) and then added it to the crockpot. 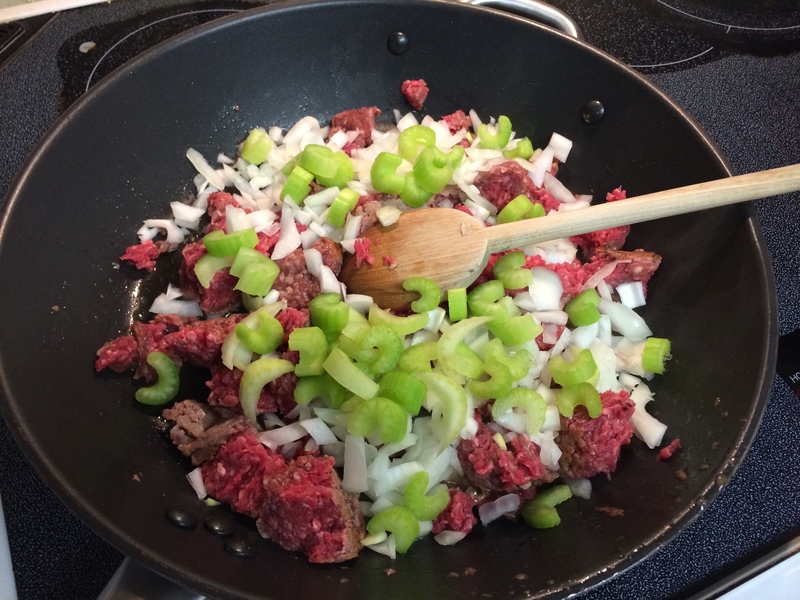 I browned the ground beef with onions, garlic and I added some celery to it, too. 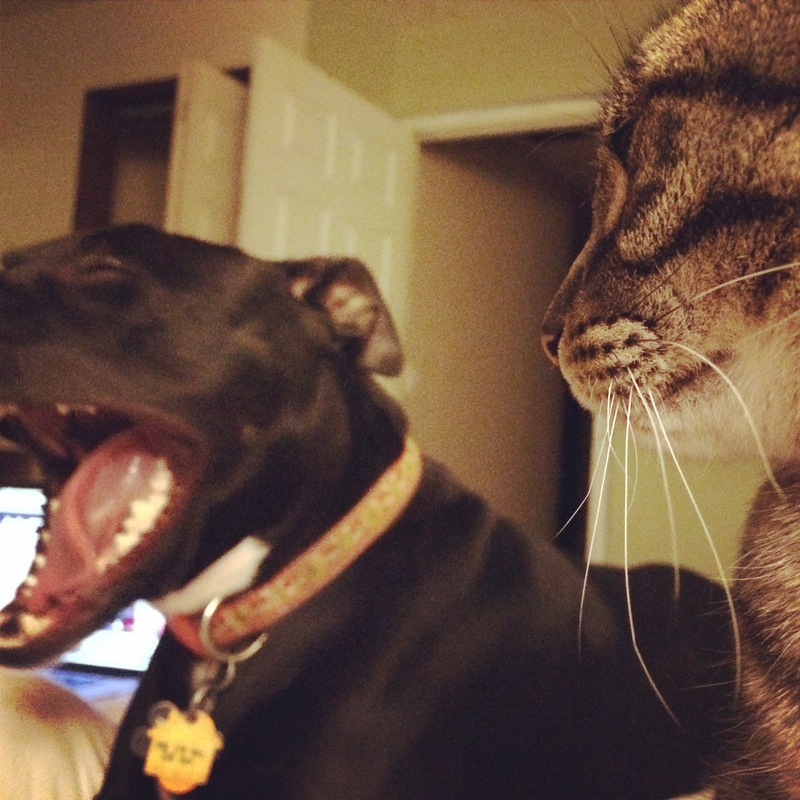 Bella and Fat Kitty weren’t too excited either. Anyways, dinner was finally ready! The chili was hearty and filling. I’m not really sure how the author of this recipe came up with the servings sizes…I halved the recipe and it made a TON of food. I cannot even imagine how much food it was if I made the whole recipe, which supposedly made 8-10 servings. With my portions I got 7 servings out of this! I froze some of the leftover chili and saved some of it for quick dinners for later in the week. The calories were a little bit too high for me to take for lunches. With my alterations and re-calculations of the servings I got 550 calories. I liked the smokey flavor of the chili but it wasn’t spicy at all. I tend to prefer spicy chili. Michael said the chili was “okay” but he’s not a huge fan of chili. (Which I totally don’t understand. Chili is delicious!) I liked it. I liked the addition of the chunks of steak; I’m glad I added some celery and I think instead of adding sugar to this I’ll add some chopped up carrots instead to sweeten it. Or I’d leave the sugar out. Oh! And I also got to use a jar of my own canned tomatoes from the garden last summer! 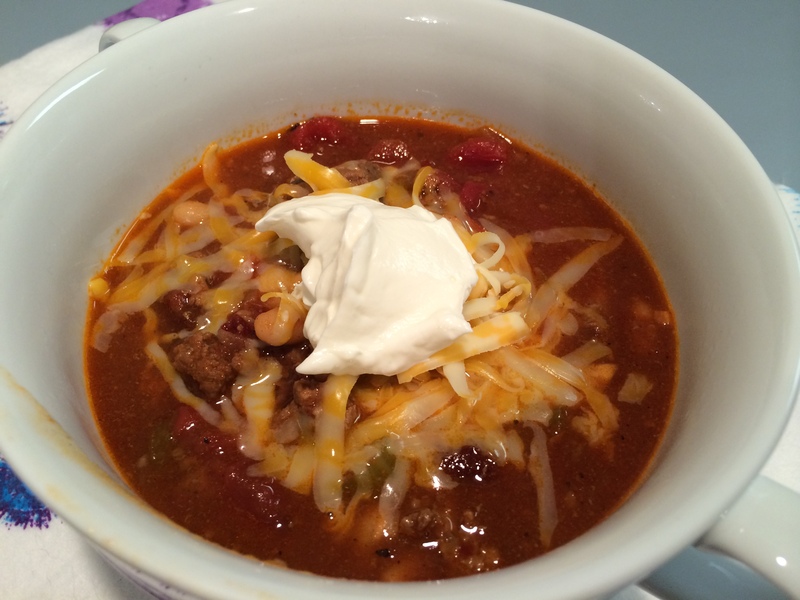 I topped the chili with cheese and a scoop of sour cream because I put sour cream on everything I can. 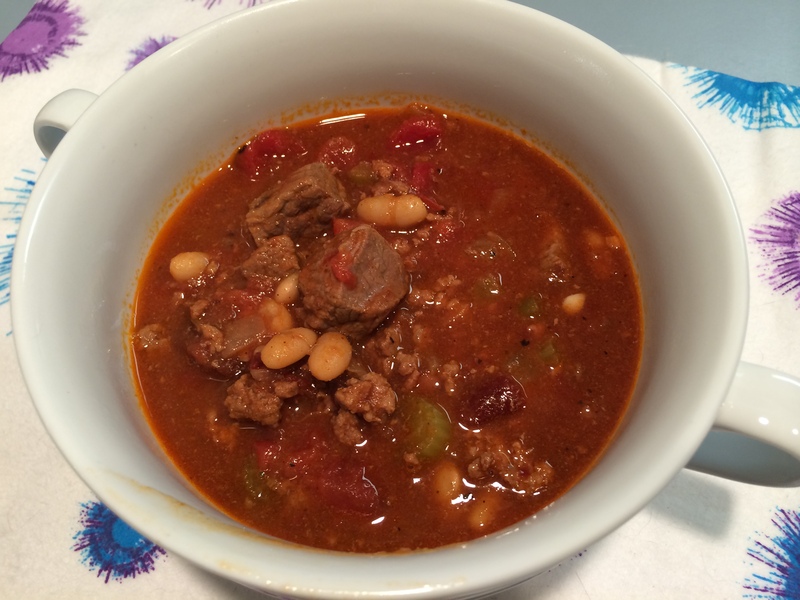 While I really liked this chili, it wasn’t THE recipe. I’m not sure what it needed to be that magical recipe I lost years ago. It was good enough that I’d happily make it again (but make it more spicy) and I’d serve it to a group of people but…the search still continues. I ALMOST added a bunch of buffalo sauce to it. LOL I might add some to the leftovers to try it. I can vouch for Biz’s Buffalo Chicken Chili! That’s awesome! Thanks for the recommendation. I need to try that. It’s rich and meaty, but I always end up adding cayenne and red pepper flakes to taste because we like it spicy! You can also add any old toppings you want. Oooh red pepper flakes. Shoulda done that. Next time! CARLA recently posted..Stop hacking life.